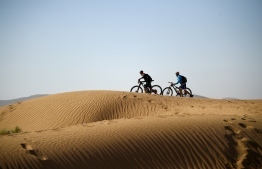 The Titan Desert 2018 is a mountain bike race between the Atlas Mountains and the Merzouga Dunes in the Sahara Desert, covering 619 kilometers. 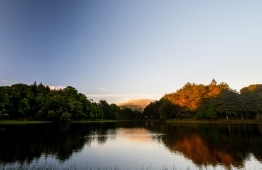 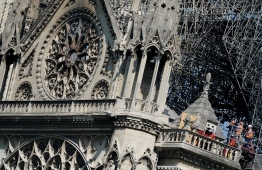 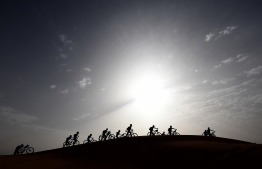 The race took place over six days in six stages, with 612 cyclists - including over 70 women - representing 22 nations. 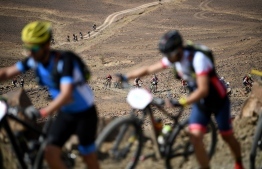 Competitors ride their bikes during Stage 5 of the 13th edition of Titan Desert 2018 mountain biking race around Merzouga in Morocco on May 3, 2018. 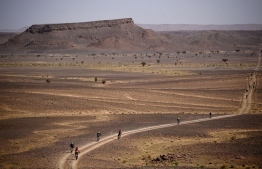 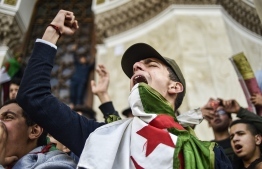 The Titan Desert 2018 is 600 kilometre mountain bike race completed over six days, snaking between Boumalne Dades, at the foot-slopes of the High Atlas summits, and Erfoud, an oasis town in the Sahara Desert. 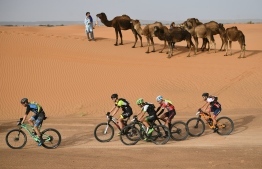 Competitors push their bikes along a sand dune during Stage 4 of the 13th edition of the Titan Desert 2018 mountain biking race between Boumalne Dades and Merzouga in Morocco on May 2, 2018. 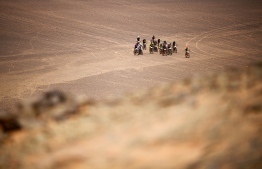 The Titan Desert 2018 is 600 kilometre mountain bike race completed over six days, snaking between Boumalne Dades, at the foot-slopes of the High Atlas summits, and Erfoud, an oasis town in the Sahara Desert. 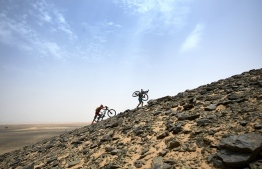 Competitors push and carry their bikes up a sand dune during Stage 5 of the 13th edition of Titan Desert 2018 mountain biking race around Merzouga in Morocco on May 3, 2018. 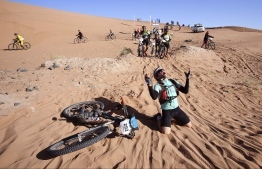 The Titan Desert 2018 is 600 kilometre mountain bike race completed over six days, snaking between Boumalne Dades, at the foot-slopes of the High Atlas summits, and Erfoud, an oasis town in the Sahara Desert.